A poor season in 2006/7 by King's usual high standards saw them relegated after finishing on just thirteen points, seven points adrift at the bottom of the table. I would add however, that King's seemed to be undone by an inability to score goals rather than a complete inepitude. I'm sure they will bounce back. Ed Walker summer 2007. 2008 and King's appear to be back on the rails. They finished third in Division Two, the last of the promotion places, losing just four of their twenty-two league games, scoring a commendable eighty goals. A disappointing Cup campaign, although they had a tough draw in Group C with Clarendon, Amblecote, Chawn and City. 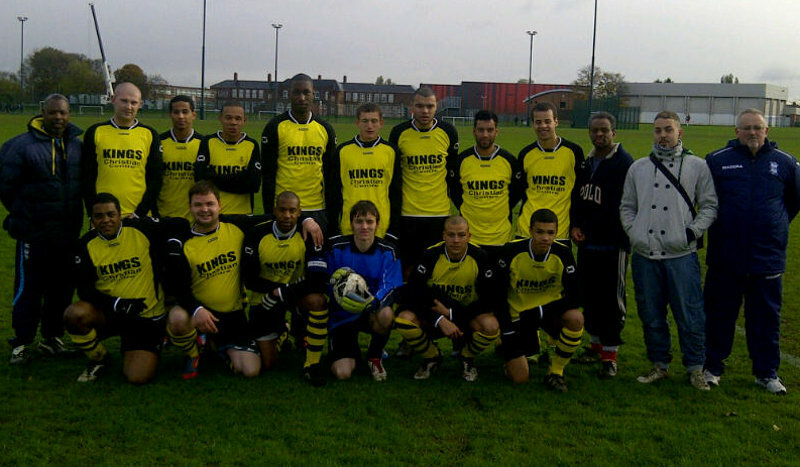 King's also entered the National Cup and did well. The progress made in the said cup, combined with some weather cancellations meant that King's had many games to make up. Despite some slippage, King's came through and subject to ratification at the AGM, will be playing Division One football again next season. Ed Walker June 2008. May 2009: Again, an improvement on last year returns King's to where they belong: In the upper echelons of WMCFL. Whilst King's did finish miles behind the top two, they were top of the chasing pack and third in Division One. Form came and went during the season, but there were more of the better games than the poorer ones. Still no League Cup. King's fortunes were mixed over the next few seasons, mid-table, fourth and then relegated as they just missed out on retaining their Division One status. Willis and Vernon are winners though and have played in and managed a succession of sides who have not only competed at the highest level but won the league several times.